A murder accused took a bus to London just hours after a restaurant manager was stabbed to death. Witness Catherine Spiers, 60, told a court she travelled from Drongan, East Ayrshire, to Glasgow with Jagtar Singh. 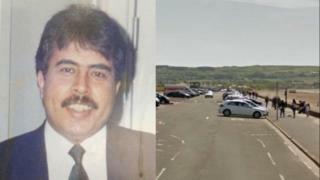 He is one of three men accused of murdering Ansar Shah, 38, in Ayr, South Ayrshire, on 4 October, 1993. Mr Singh, 51, his brother Jaspal Singh, 54, and their friend Balwant Singh, 58, deny repeatedly stabbing Mr Shah in the car park of the Armaan Restaurant. Ms Spiers, who was married to Balwant Singh, told the jury she was at the car park on the day of the murder. She said: "I saw a man lying motionless in the car park as I drove away. "We had seen horrific events and were traumatised." At about 09:00 Ms Spiers told police she received a phone call telling her that Mr Shah was dead. In evidence she said she remembered getting the call, but could not remember telling Jagtar Singh that he was dead. After taking her children to school she went to get the bus with Jagtar from Drongan to Ayr. The court heard that they then took a train to Glasgow Central and walked to Buchanan Street bus station. Prosecutor Richard Goddard said: "He got a ticket down south the same day a man had been stabbed to death, why was that?" The witness replied: "I don't know." The court heard Ms Spiers told police in a statement on 6 October, 1993, that she asked when the bus for London was and a woman told her 13:00. The statement continued that she walked away while the ticket was being printed and left Jagtar to pay for it. Ms Spiers told the court it was the last time she saw Jagtar Singh and she said it never entered her mind to ask why he was leaving. Jagtar Singh and Jaspal Singh, of Slough, Berkshire, and Balwant Singh, from Dalmellington, East Ayrshire, deny murdering Mr Shah. Jagtar Singh also denies attempting to defeat the ends of justice by changing his clothing and fleeing to England.